Shriram Transport Finance Company (STFC) reported subdued earnings for Q3 FY19, although management commentary points to better quarters going forward. Strong future guidance albeit a soft quarter. The management expects assets under management (AUM) to grow 15-18 percent in FY19 (from 14 percent year-to-date), thereby pointing to acceleration in growth in Q4. The company is also quite confident of achieving 20 percent AUM growth in FY20 as it expects demand for commercial vehicles to bounceback on account of pre-buying ahead of implementation of Bharat Stage-VI (BS-VI) by 2020. The increase in prices due to BS-VI implementation should have a positive rub off on prices in the used vehicle market as well. Activity level on the ground has improved since mid-January after remaining subdued for a while and this provides medium-term visibility for the business. The company has raised resources that should provide adequate support for near term growth. It has raised Rs 4,300 crore capital through issue of non-convertible debentures (NCD) and is about to complete raising the remaining Rs 700 crore. For FY20, it has targeted raising Rs 10,000 crore through retail NCDs. 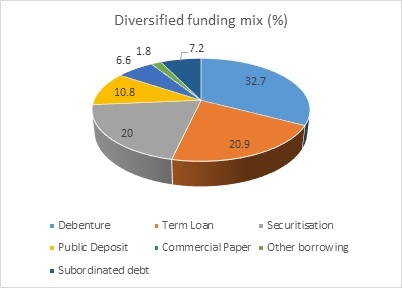 STFC has diversified its borrowing profile and has not seen funding challenges, although cost of funds have seen an increase. Despite markets seeing some slowdown, collection efficiency remains strong. Gross and net Stage 3 assets (NPAs) remains stable at 8.78 percent and 5.86 percent, respectively, with provision coverage (provisions held against NPAs) hovering around 35 percent. The entity remains well capitalised with capital adequacy ratio (CAR) at 19.72 percent. Growth in AUM decelerated 14 percent year-on-year from over 20 percent growth seen in the preceding two quarters. The management took a conscious decision to preserve cash amid a challenging environment. It increased its lending rate and reduced the loan-to-value ratio, which had put a brake on growth, especially for new commercial vehicles and business loans. Notwithstanding the increase in lending rates in recent times, the increase in cost of funds resulted in compression of net interest margin by 13 basis points (100 bps= 1 percentage point) YoY and eight basis points sequentially to 7.44 percent. Festive demand was subdued in the quarter under review and that had an impact on recent performance. The company alluded to slowdown in infrastructure activities in the quarter gone by and continued lack of momentum in real estate activities, which is a big demand driver for commercial vehicles. The company has access to external commercial borrowing (ECB) to the tune of $350 million in case if wants additional resources. Most of its markets/geographies are stable and Kerala has staged a recovery. Only certain parts of Madhya Pradesh and Maharashtra have been affected by drought conditions. The company sold loans worth Rs 5,386 crore through securitisation and assignments in Q3. Securitisation is conversion of a loan into marketable securities for raising cash by selling them to other investors. 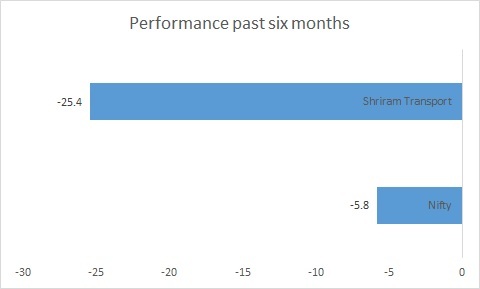 Amid the crisis engulfing the non-banking financial company (NBFC) space in the aftermath of the Infrastructure Leasing & Financial Services (IL&FS) default, the stock has underperformed. The company is entering a seasonally strong period and liquidity in the balance sheet will clearly give it an advantage over peers. The medium term outlook is promising for this niche entity. The correction in the stock price has rendered valuation attractive at 1.5 times FY20 estimated adjusted book. Investors may find the current weakness a right opportunity to accumulate the stock.